Gabe Newell's three favorite games of all time are surprisingly not Half-Life, Portal, and Half-Life 2. Valve co-founder Gabe Newell is what you might call a "playa." He's at the top of a company that puts out great games like Half-Life and Portal, and also runs incredibly successful digital distribution service Steam. As an idea of what inspired this rise to power, Newell has laid out his three most important games of all time, and none involve Gordon Freeman. One of Newell's favorites, the Star Trek text game for a Burroughs mainframe, would be pretty tough to play today on its original hardware. For Newell, it was the first game he ever laid hands on. Newell told CVG he and his brother used to type out moves on punch cards and put them into the machine, taking about 10 minutes for each move. "I was hooked," Newell said. Number two is a bit easier for the current-day gamer to understand. Newell revealed that the original Doom made him "rethink everything" about videogames, from control systems to design to rendering. "It convinced me that games were the future of entertainment," he added. The third is a title you can play on your Nintendo DS, or 3DS, right now. 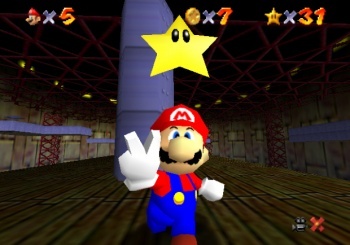 Newell says he still has "vivid dreams" of Super Mario 64's different levels. He praises its tight controls, made possible by the N64's analog stick, and even goes so far as to say it convinced him that "games were art." Every gamer has a list of titles that have made him/her the type of player that he/she is today. These three just happen to have inspired one that's possibly a billionaire. It might be worth it to play them, just to see if they work their magic on you too, especially if you can find a mainframe.